Tinytag data loggers monitor warehouse temperatures to ensure pharmaceuticals are stored in the correct conditions. Live drug products stored in a warehouse were monitored to ensure they were stored within the correct temperature range, in order to maintain their effectiveness. Martin Robson is the Warehouse Manager for the APS Group, responsible for handling a wide range of goods for the Company's customers. One customer's goods included approximately six live drug products, which APS Group despatched to doctors' surgeries and health care professionals under the MHRA (Medicines & Healthcare products Regulatory Agency), wholesale dealers licence. The live products that were stored had to be kept at a certain temperature to maintain their effectiveness. If the temperature dropped too low or went too high the drug would not have the required effect on the individual receiving it. Two Tinytag Ultra 2 temperature data loggers were used, one was placed in the drug storage room, and the other in the cabinet where the returns were kept. Data was downloaded from both loggers once a month and the results were then sent to APS Group's Responsible Person (RP) whose task it was to present the information to the customer or to the MHRA. Tinytags were recommended to the Company by the RP and proved much more effective than previous alternative products. Martin comments, "The Tinytags are small but hold a very large amount of data. They were easy to use and the information produced was just what we needed. I was very satisfied with the data loggers and would highly recommend them to anybody!" 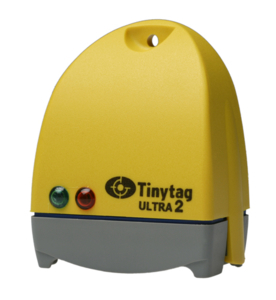 Monitor phamaceutical storage temperatures with a Tinytag Ultra 2 data logger.